BOSTON — It’s late June in coastal New England, which makes it the silly season for sharks – that time of year when we have a combined giddy fascination and horror with the ocean’s top predators. Wednesday night, Boston TV stations featured prominent stories on the detection of electronically tagged great white sharks off Cape Cod, which is a little early but still a routine event. Apparently seeking to balance out the celebrity obsession with great whites, a member of the region’s largest shark species nearly got stranded in the tidal Pocasset River Thursday morning. Some empathetic and curious by-standers shot some amazing video courtesy of their iPhone. Ironically, this 12 to 14 foot shark is a juvenile. Adult basking sharks in New England waters are commonly more than 20 feet long and can reach in excess of 30 feet. Greg Skomal, the state’s shark biologist, often jokes that it is a whale caught in a fish’s body! Basking sharks are the second largest fish species on the planet, and they migrate into New England waters early each summer to filter feed on animal plankton called copepods. They can often be seen cruising with their enormously expandable mouths agape very close to shore. With a prominent dorsal or back fin sticking out of the water and their sheer size, they stimulate epidemic-like enthusiasm among those who see them, from beachgoers to boaters. Most often, people assume that they are great whites. Two years ago this week, a Boston TV station ran video shot by a boater of what they reported as a great white shark in excess of 25 feet off Newburyport. It was in fact a basking shark. Great whites rarely get over 20 feet, they do not frequent Cape Ann often, and the video showed the low-key, passive filter feeding of a basking shark. Basking sharks are the moose of local waters — often in proximity to human habitat and not easily disturbed by our presence — while great whites are quite elusive and very difficult for even scientists to find without the aid of aerial spotting. 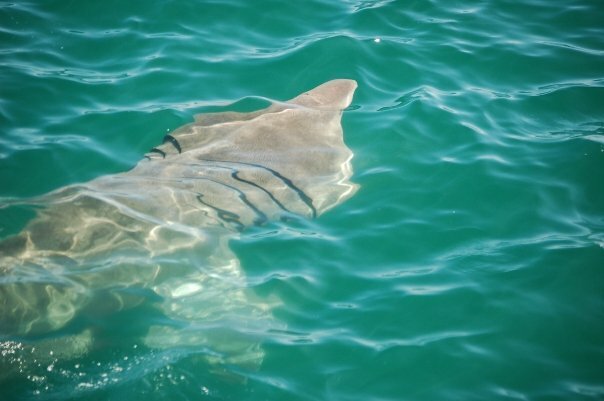 When someone sees a large shark in Massachusetts near shore, chances are that it is a basking shark. Great whites and basking sharks can be difficult to tell apart when not feeding. Onlookers should ALWAYS exercise caution around any large wildlife and any species of shark. The basking shark seen today could easily have broken the leg of someone trying to assist it to get back into deeper water as it thrashed about. Another interesting aspect of today’s basking shark video was the encouraging comments made by the onlookers as the shark struggled to get in deeper water. It reflects the fact that much of the public has come to understand the key role that sharks play ecologically in the ocean. There are approximately 15 shark species that frequent New England waters. Among the big three shark species that are sometimes a threat to people globally, only one species, great whites, frequent area waters. There has not been a fatal shark attack in New England since 1936, over 75 years. People are thousands of times more likely to drown, die of an allergic reaction to an insect sting or die in a collision with a deer on the drive to the beach. In the last 15 years, two men have died at Massachusetts beaches after the sand pits that they were digging collapsed on to them. Sharks are large, unpredictable wildlife. When they are observed, get out of the water and follow the directions of local officials. People need to be careful around any large wildlife whether they be moose, sharks, bears or seals. Do not swim or surf in the presence of seals. Seals are on the menu of great white sharks while people are not. Yet getting out of the water in the presence of seals minimizes the possibility of a mistaken identity hit.